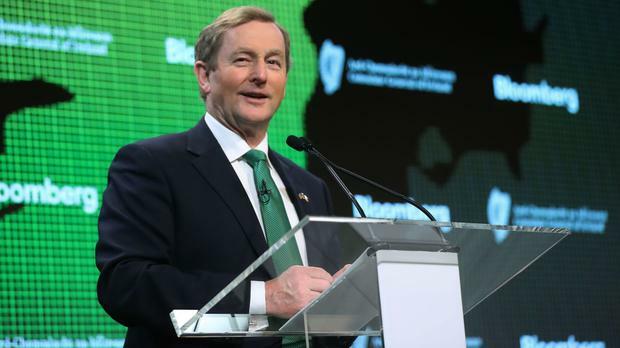 Taoiseach Enda Kenny has staunchly defended Ireland's membership of the European Union as he described Brexit as a solely "British policy". Speaking to Bloomberg in New York, Mr Kenny rejected any suggestion that Ireland could follow in the UK's footsteps and quit the EU. "Brexit is a British policy and was certainly not what we wished for in Ireland," Mr Kenny said. "It is not a trigger for Ireland to follow suit. Nor is it the beginning of the end of the European Union." The Fine Gael leader said how the EU deals with Brexit in the coming months would "define the future of Ireland for decades to come". "We are absolutely determined to minimise any negative economic impact, protect the Northern Ireland peace process, maintain our common travel area with Britain and promote a stronger, more effective European Union in the years ahead," he added. Mr Kenny said he and British Prime Minister Theresa May are in agreement that there will be no return to direct rule in Northern Ireland. The Taoiseach also suggested he would refuse to sign off on a Brexit deal that involved a return to a hard border with the North. "It is a political challenge to deal with it. It will have to happen because I won't sign for anything else," he said. Mr Kenny drew inspiration from the late John F Kennedy. The 100th anniversary of the former US president's birth takes place in just over two months' time. Mr Kenny quoted remarks he made to the Irish Parliament in 1963: "No nation, large or small, can be indifferent to the fate of others, near or far. "Modern economics, weaponry and communications have made us all realise more than ever that we are one human family and this one planet is our home."